Since 1967, La Casa Restaurant has provided Sonoma area residents and guests with flavors that go above and beyond traditional Mexican fare thanks to a variety of Jalisco flavors. Jalisco cuisine combines the unique flavors of Guadalajara and Puerto Vallarta to create outstanding and lively dishes full of fresh spices and ingredients. La Casa Restaurant is a great place for families and friends thanks to the warm, welcoming atmosphere and casual vibe. Enjoy complimentary chips and salsa along with a steak fajita burrito, the La Casa taco salad, crunchy beef tacos or chile relleno with refried beans. La Casa Restaurant also offer plenty of kid-friendly fare as well as a selection of alcoholic beverages, such as margaritas for the adults. fresh smashed avocados, onions, jalapeno chilies, tomato, garlic, cilantro & lime. made fresh daily. tell your server how spicy you like it! refried beans, jack cheese, sour cream, chipotle, and ranchera sauce mixed into a tasty chip dip. shredded beef or chicken wrapped in a flaky tortilla pastry and then lightly fried. served with a side of guacamole and sour cream. two thick corn tortilla bowls filled with shredded beef or chicken, beans, lettuce, queso fresco, jalapenos, and sour cream. lightly fried jalapeno peppers stuffed with cream cheese. served with homemade garlic ranch dressing. a large flour tortilla filled with jack cheese and garnished with guacamole, sour cream, and salsa fresca. our homemade tortilla chips topped with beans, melted cheese, salsa fresca, sour cream, guacamole, and jalapenos. juicy skirt steak topped with onions, cilantro and tomatillo sauce. grilled chicken topped with onions, cilantro and ranchera sauce. pork roast, shredded and topped with tomato salsa, onions and cilantro. grilled pork topped with onions, cilantro and tomatillo sauce. fresh prawns marinated in lime, onion, tomato, and cilantro. served cold on crispy corn tortillitas and garnished with sliced avocado. great for sharing! includes cheese quesadillas, jalapeno poppers, beef chimichangitas, chicken sope, beef taquitos, and chicken flautas. served with homemade garlic ranch and ranchera dipping sauces. a favorite among customers and employees alike! fresh roasted chicken in a light broth with salsa fresca, cilantro, tortilla strips, and cheese. in loving memory of john william herbst. made with jack cheese in a light chicken broth, served extra hot, just how he liked it! romaine lettuce, chopped tomatoes, tortilla strips, grilled corn, sliced radish, queso fresco, jicama, avocado slices, and bell peppers. dressed in our chef arturos own avocado dressing. this incredible salad was first created by caesar cardini of tijuana, mexico in 1924. made with romaine lettuce, homemade caesar dressing, tortilla strips, pico de gallo, and queso fresco. once known as the gringo salad, this salad consists of marinated strips of grilled chicken breast placed on a bed of lettuce and layered with whole beans, rice, cilantro, tomato, cucumber, and carrots. dressed in our house tomato vinaigrette. a crispy tomato-flour tortilla bowl filled with your choice of grilled chicken, steak, beef, or sauteed seasonal vegetables. mixed with rice, beans, lettuce, salsa fresca, cheese, sour cream, guacamole, and tomato vinaigrette. your choice of grilled chicken or skirt steak, wrapped in a flour tortilla with rice, guacamole, sour cream, and your choice of beans. topped with half mild chili sauce, and half mild verde sauce. everything you get with our fajitas wrapped together in a flour tortilla. your choice of grilled chicken or skirt steak, mixed with sauteed onions and bell peppers, rice, salsa fresca, and your choice of beans. topped with ranchera sauce and melted cheese. served with sour cream & guacamole on the side. fresh seasonal vegetables cooked in a white wine sauce and wrapped up with sour cream, guacamole, and your choice of beans. topped with our mild verde sauce. a la casa classic! ground chuck (beef) and lettuce wrapped together with cheese, and your choice of beans. topped with our mild chili sauce, and served with sour cream on the side. a long time favorite returns! shredded roast chicken, rice and beans wrapped in a flour tortilla and topped with verde sauce, melted cheese, and sour cream. fresh prawns in a delicious cocktail sauce with tomatoes, onions, cilantro and avocado. fresh fish and prawns marinated and sauteed with onions, bell peppers, and spicy salsa. laid on mexican rice, with your choice of sauteed seasonal vegetables, beans, or side salad. may be served mild upon request. accompanied by your choice of flour or corn tortillas. fresh prawns sauteed with roasted garlic, onions, and tomatoes. 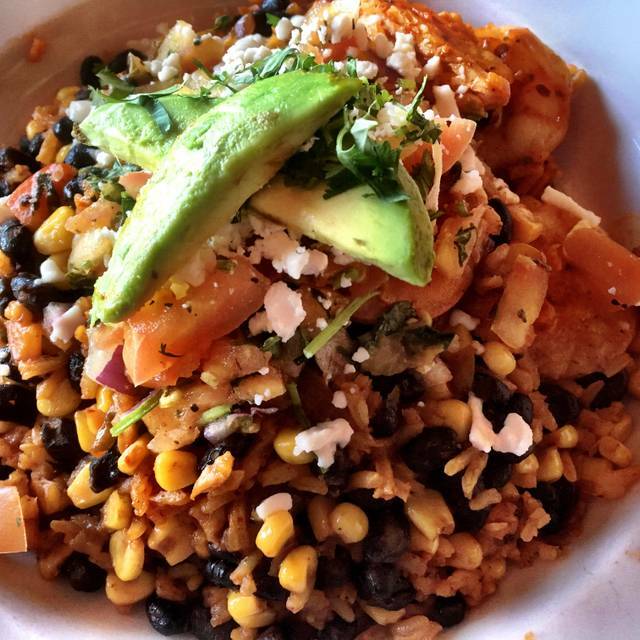 laid on mexican rice, with your choice of sauteed seasonal vegetables, beans, or side salad. accompanied by your choice of flour or corn tortillas. fresh prawns marinated in lime, onions, cilantro, and tomatoes. served cold on two crispy corn tortillas and topped with cilantro and fresh avocado. sauteed shrimp rolled in a soft corn tortilla and topped with a verde tomatillo sauce and salsa fresca. served with a side of rice and sauteed seasonal vegetables. two enchiladas per order. two fish tacos made with the catch of the day. the first: sauteed and spiced served on a soft corn tortilla filled with dressed lettuce and topped with salsa fresca. second: a grilled filet served on a flour tortilla with avocado-tomatillo sauce. try one of each or both the same. All Fajitas Are Served Sizzling Hot With Grilled Onions And Bell Peppers. Fajitas Are Accompanied By A Side Plate Consisting Of Sour Cream, Guacamole, Salsa Fresca, Rice, And Your Choice Of Beans And Tortillas. tender, lean marinated skirt steak. giant tiger prawns marinated in lime. have it all! chicken, steak & prawn. seasonal vegetables sauteed in white wine. All Entrees Are Served With Mexican Rice, Side Salad, And Your Choice Of Beans. two chicken enchiladas in soft corn tortillas topped with verde tomatillo sauce, cheese, and sour cream. a trio of enchiladas! the first, red: a cheese enchilada topped with mild red chili sauce. second, white: a beef enchilada topped with sour cream. third, green: a chicken enchilada topped with verde sauce. two enchiladas of your choice: cheese, beef, chicken, or a mix of two. topped with our mild red chili sauce and served with a side of sour cream and guacamole. two fresh tortillas filled with sauteed seasonal vegetables, and guacamole. topped with verde sauce and salsa fresca. three eggs made to order, served over corn tortillas, and topped with ranchera sauce, cheese, and fresh pico de gallo. jalisco style - slowly simmered pork roast, shredded and served with fresh tomato salsa, cilantro, and jalapeno marinated vegetables, and your choice of flour or corn tortillas. slow roasted pork, cubed and juicy. smothered in a verde tomatillo sauce over a bed of mexican rice. served with your choice of flour or corn tortillas. 8 oz of tender juicy skirt steak. served with sliced tomatoes, onions, roasted peppers and avocado. a crispy fried taco stuffed with chicken or beef, lettuce, salsa, mexican cheese, and sour cream. soft taco: a soft corn tortilla filled with your choice of chicken, beef, carne asada, carnitas, or al pastor. served with onions, cilantro, and topped with tomatillo sauce. a cheese, chicken, or beef enchilada covered in mild red chili sauce. chicken or beef rolled in a corn tortilla then fried. chicken or beef rolled in a flour tortilla then fried. a fire roasted chili, peeled and stuffed with mexican cheese, then fried in egg batter and topped with ranchera sauce. ground chuck, grilled to your desired temperature and topped with jack cheese. 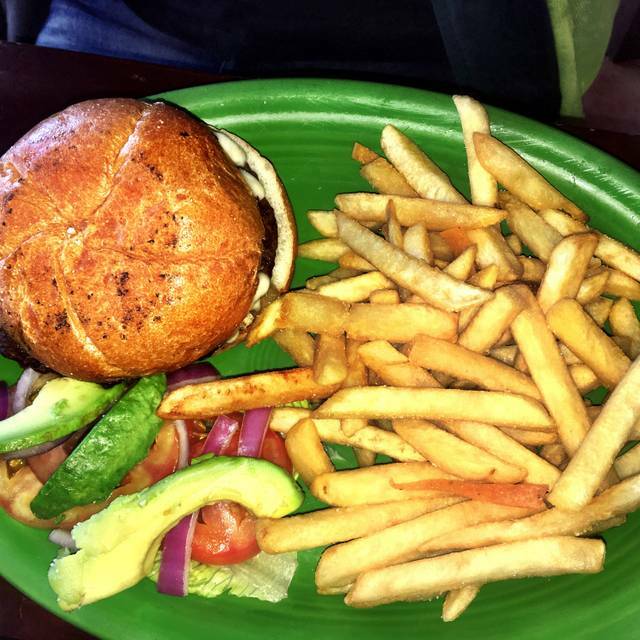 served with lettuce, tomato, onion, pickle, and seasoned fries. grilled chicken breast served on a crunchy sour roll with jack cheese, light mayonnaise, and sliced avocado. your choice of seasoned fries or a side salad. Great recommendation from another dining place. Huge portions, glad we split one meal of carnitas. Amazing service, already knew the food would be outstanding. Our server, Roberto, always showed up at the right time. The back up staff made sure we had water and fulfilled any other request. Doubled Roberto's tip as well deserved. Great Happy Hour selections, beverages and food. The food is very good. Our server was not. He was not attentive and other servers had to help us because he never returned. I have enjoyed La Casa many times over the years, but this visit was not a pleasureable one as a group of very noisy women were seated near us. Groups like that should be able to yell and scream while others try to have a conversation or relax while they dine. I was disappointed that the management did nothing to curb their rowdiness. Good food and service. Excellent salsa and guacamole. Whole jalapeno pepper they served with the meal was unbearably HOT!! Carne Asada was a little tough to cut but cooked perfectly. Friends and I scheduled a dinner date and we was there 2 1/2 hours enjoying each other’s conversation and the food was great! Thanks for allowing us to stay and chat after eating. We enjoyed our dinner very much. Service was terrific. We’ll be back! I cannot give 5 stars as it was so loud, we couldn’t carry on a conversation with our party. We went to eat with friends we hadn’t seen in years. La Casa was their choice. It was not very busy, yet another group of 5 got seated right next to us. They were so loud, we could not hear ourselves and left soon after we finished, although we would have liked to have visited a little more. I do have to say, the margaritas were good and the food was very good. Next time, I will request to not sit in the middle of the room. The avocado relleno was excellent. The shrimp fajitas were lacking. I would return for the relleno. Delicious food, lots of options, including gluten free choices and a nice selection of wines offered by the glass. Good for nut allergy sufferers as nothing on the menu contains nuts. Very generous portions. Great service - welcoming, attentive & efficient. It was a little quiet later on (9pm onwards) so for a better atmosphere it might be best to book earlier. Brilliant value. Food came before drinks! Food order was not followed delivered i correctly. Took too long to resolve. Disappointing visit, suggest you visit another restaurant. We brought out of town friends here for a nice gathering and lunch. The food was outstanding! Everybody raved and said it was the best they had ever had. The downside for us was the noise level, it was so noisy w could barely talk to each other. We wish the hostess would have offered outdoor seating to us - we noticed on the way out the patio seating was nice and would have much preferred it. We will ask for that next time. It might be quieter on a weekday too, as the inside seating seemed to be large groups and families maybe having Sunday lunch. We will definitely be back - outstanding food and service! Great Margaritas. Food and service were also very good. Always great service and all staff acknowledge customers when passing each other. Large portions, really good comfort food. The chicken fajitas were delicious! We were out and about with friends and wanted something casual. We shared the sampler plate (delish) and nachos. We will eat here again! Service was polite and our waiter checked in enough times to make sure everything was good and drinks were refilled. We sat on the patio in back and it was lovely. Great food & service. Nice atmosphere. Great margaritas. Very reasonably priced. Mothers' Day. Always good food, good table. Good service. Been coming here for over 20 years. Food was good but way too noisy and bright with lots of little kids. The chips and salsa were great. The steak fajitas..... not so much. The meat was swimming in oily water. Very little flavor and cold. Definitely not sizzling fajitas. And we don't mind noise, but this is not the place to go if you plan on conversation. Food was “ok” but it wasn’t the best Mexican food I have eaten. We came for lunch on a Sunday and the place was half empty, so there was no noise, service was fast and we felt very comfortable. Kids menu was ok and the burger they received looked dull. However, our portions were very big and very tasty. Their homemade nachos and salsa are very good and being refilled until you ask them to stop. Overall, good value for your money. There were three of us. Service was slow. When Tyson of the dishes finally arrived they were both Under cooked and needed to be sent back. This restaurant specializes in Mexican food. Being in California we thought we would picked a winner. We did not. We were celebrating my mother’s birthday and we did get a good table next to the window, with a view of the Mission . Unfortunately, the food and margaritas were not very good. We shared the paella and we found it very bland and the maragaritas tasted like lemonade. Nice happy hour menu. Moved into the main dining room and there were a few problems. Gal came over with water right after we were seated and we said yes when she asked if we wants chips and salsa, but they never came. Waiter then took our order and when food arrived, side dish of veggies were never brought as ordered. Not very attentive after food served, water glasses were left empty. Food was delicious i have to say. Restaurant wasn't overly busy, there were some empty tables so not sure what happened. Good Mexican food with great service. Nice ambience, as well. I have been eating here since 1968 and have continued to do so all these decades. the food is absolutely spectacular, we had Mexican paella and a Mexican cheeseburger both super super delicious. We were disappointed in La Casa. We expected better Mexican food in Sonoma. My chicken enchilada was flavorless and the salsa was very bland. My husband’s burrito was huge but not as good as we get back in the Midwest. On the plus side, the staff was friendly and the service was great. Unspectacular mexican food. Chips were ok, needed salt. Was surprised it wan't better, was highly rated on tripadvisor. Poor service. Waiter dropped silverware on me as he was clearing the table. Got food all over me. No apology. No acknowledgment. Had to ask for water. Had to ask for everything. A wonderful reasonably priced Mexican restaurant on the Square. Why don’t you have queso ?